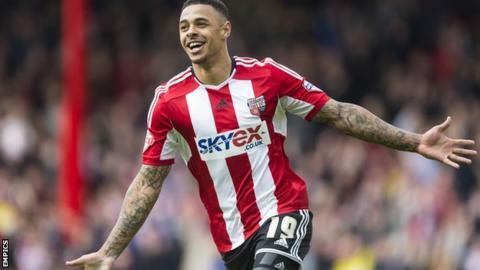 Brentford striker Andre Gray has turned down a move to Championship rivals Bristol City, Bees coach Marinus Dijkhuizen has confirmed. The Robins had a £9m bid for the 24-year-old accepted on Tuesday. Dijkhuizen told a news conference on Thursday the former Luton player had not agreed terms on a move to Ashton Gate and was training as usual. Hull City remain interested in Gray, despite manager Steve Bruce indicating he did not expect the club to sign him. Speaking after Wednesday's 2-1 win over Fulham, Bruce said: "I think he'd be a terrific asset for us, but unfortunately it is not to be." BBC Radio Humberside believes, however, that Gray is keen to join the Tigers. Gray is in demand after scoring 18 goals last term as Brentford reached the Championship play-offs and he has found the net in both of their Championship fixtures so far this season. "We've chased him for a long, long time, but we have not matched what Bristol have offered. We've known the price all along," Bruce added. "It's pretty straightforward, we've not matched their valuation. It's frustrating but that is football management." Gray is the second striker to turn down a move to Bristol City in the last week, after Dwight Gayle opted against a switch from Crystal Palace. Bruce confirmed Hull are also keen to sign Gayle, who is thought to be valued at around £8m by the Eagles. "He's a good player, but whether we can afford him I don't know. We've made an enquiry," he added.